As I've gotten get older (and busier), I’ve learned that spring cleaning doesn't have to to be a huge, time-consuming affair in order to be effective. Even if you don’t have time for a deep clean, something as simple as throwing open the windows or wiping down the countertops with a spring-scented cleaner can breathe new life into a tired space. After a dreary winter, I always look forward to the return of spring and Mrs. Meyer’s spring scents: Mint, Peony, and Lilac. Mint smells just like the real thing — sweet and cool. Peony and Lilac are subtle floral scents that remind me of a spring garden in bloom. To me, a clean home begins with the products you use — so I’m always looking for ways to eliminate toxins in my cleaning routine. 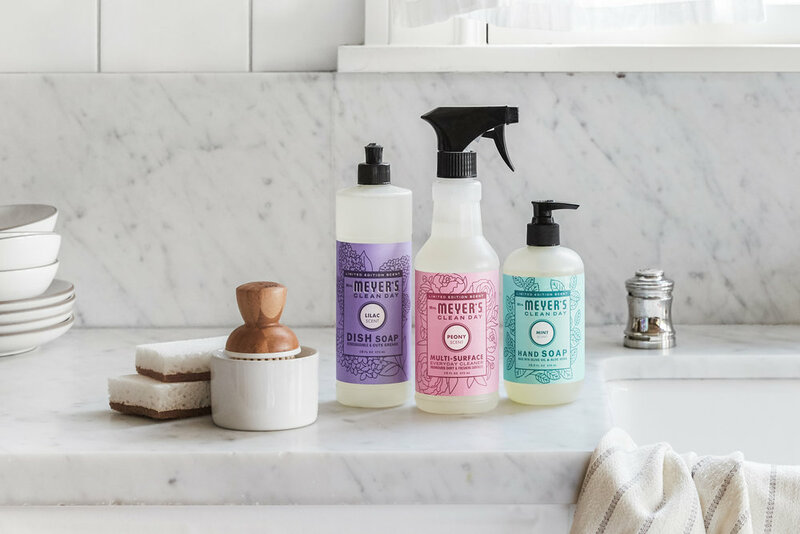 All of Mrs. Meyer’s products are made with plant-derived ingredients and essential oils, so I can feel good using them around my family. 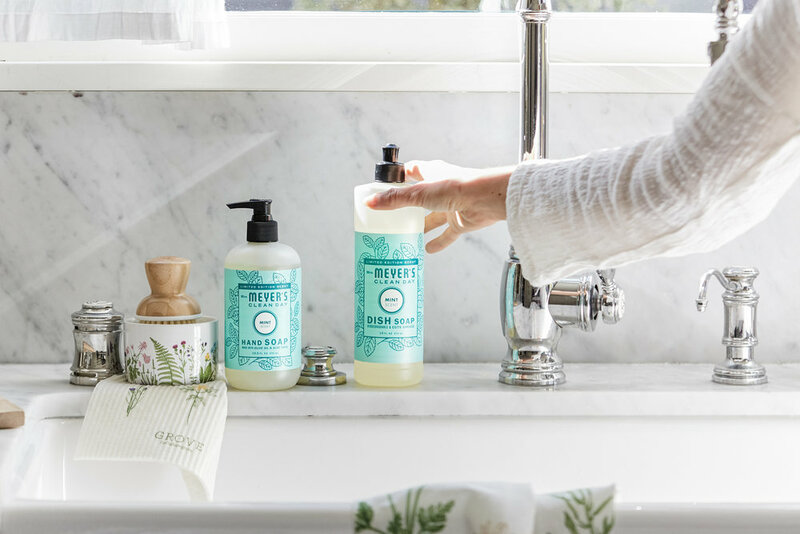 In addition to Mrs. Meyer’s soaps and multi-surface spray, the spring cleaning set comes with a limited edition Grove Collaborative bubble-up brush with a beautiful wildflower print. Not only does it look beautiful sitting next to my sink, it also makes the task of doing dishes much more enjoyable! Now that sunny days are in the forecast, I’m all for anything that helps me get things done faster and have more time to work in my garden or go for a walk. That’s where Grove Collaborative comes in! Grove makes creating a healthy, beautiful home effortless and affordable. They hand-select the best natural products and deliver them (carbon offset) right to your doorstep, on your schedule. Grove has you covered for all your spring cleaning needs. After your first order, Grove will recommend a personalized monthly shipment so you never run out of the products you love. You can add or remove products or change your shipment schedule with a few clicks. When you sign up for Grove using my link, you’ll get the spring cleaning set for free with your first order of $20. Plus, if you spend at least $39, you’ll receive a beautiful stoneware tray for free! It’s the perfect size to hold your hand soap, dish soap, and bubble-up brush. Once you’ve submitted your Grove order, you’ll be signed up for the free 60 day VIP trial. I love being a VIP because I get perks like free shipping, free gifts, price matching, exclusive sales and personal service. Sign up for Grove Collaborative here. You will receive the spring set for free when you sign up! If you aren't living in a space that you are content to dwell in, have you considered the option of moving? Are you willing to step out in faith - whether it be across the nation, across the sea, or across the street - to live where God is calling you to serve your community? May today's post help you find clarity and contentment with where you call home. Do you switch to holiday scented cleaning products this time of year? I always look forward to buying new seasonal soaps and cleaners. The scent of candy canes and baking cookies just puts me in the holiday spirit! Keep reading to learn about my new favorite holiday products + how you can get them for free! Do you switch to holiday scented cleaning products this time of year? I always look forward to buying new seasonal soaps and cleaners. The scent of candy canes and baking cookies just puts me in the holiday spirit! Check out my new favorite holiday cleaning products + learn how you can get them for free in today's post. A change of seasons is always exciting. You can finally break out clothes you haven’t worn in a year. There are seasonal activities to do, holidays to celebrate, vacations to be had. Everyone welcomes summer in different ways, but don’t forget an easy way to get in the summer mood: brightening up your home! You don’t have to completely redecorate in order for your home to feel summery. There are many simple, inexpensive ways to make your indoors summer-ready. Sharing my ten favorite home, beauty, and style products for May! Also a coupon for FREE SHIPPING from the Studio!